Do you have a car payment? A line of credit? A mortgage? Do you have student loans? If you said yes to any of those questions, this post is written specifically for you. I can’t figure out when or how I came across Dave Ramsey, but I am so grateful I did. Dave is the voice of debt repayment. Every day for three hours a day he hosts a radio show that is broadcasted live on youtube, facebook and is later offered as a podcast anywhere you listen to your favourite podcasts. He teaches millions of people how to get out of debt and how to be debt free. 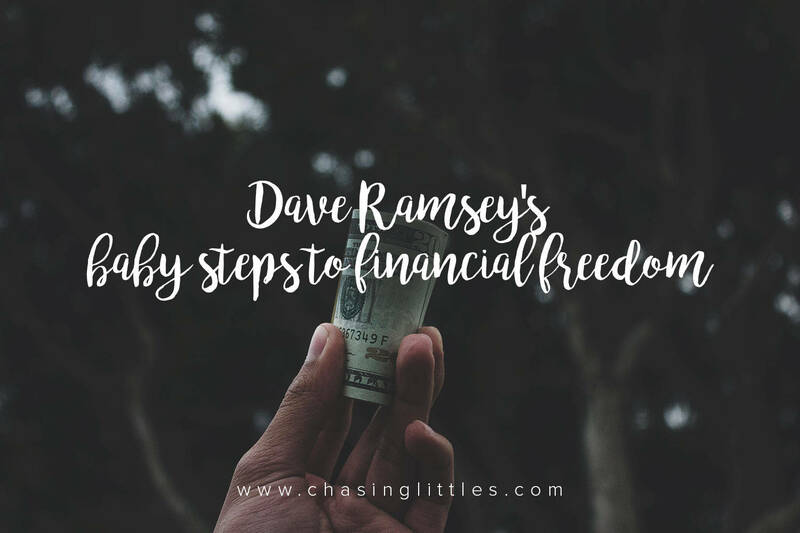 By following Dave Ramsey’s baby steps it is possible for anyone to become debt free. The hubs and I are on his plan and are currently on Baby Step 2 and crushing our goals hard. So why should I worry about debt? I make my monthly minimum payments, I’ve never been late on a payment and my credit score is awesome. Well, with most debt, the longer you have it the more money you throw away in interest payments. Banks WANT your money, and interest is their bread and butter. As Dave says, your greatest wealth building tool is your INCOME, and debt makes this number lower the more you owe! Imagine having no car payments, imagine keeping all the money you make? Yeah, it’s possible, and the Dave Ramsey Baby Steps will get you there. Sell anything that isn’t attached to the floor, make a budget and cut back on expenses. Save the $1000 as FAST as you can. If you already have a savings account, take everything out of it and leave $1000 in it and put all the rest to your debt. The idea for this fund is that it’s an EMERGENCY fund. A birthday is not an emergency, because you knew it was coming up. With this in the bank you won’t have to go into debt if something were to happen. List all your debts from the littlest one to the biggest one and list your monthly minimums. Every month, make a new budget with your partner and attack that little debt with a vengeance! Throw every last dollar you can at the little one until you pay it off. When you do, take all the extra money you were putting towards the debt AND the minimum payment you were making and add it to what you pay to the second debt on the list! This is his snowball method and the idea is that the motivation of knocking off the small debts will inspire you to keep going while freeing up more money to pay off the larger debts! Now you are debt free! Congratulations!! Time to build your emergency fund to a full fund. This means, add up all your expenses for the month. Mortgage, food, utilities, insurance etc and multiply that number by how many months you want to save. He recommends 3-6 month’s worth. Now this is your new savings goal! This will allow you to be prepared were life to throw a huge wrench your way. This and all his steps are also available on his website. Now that you have no payments and a fully funded emergency fund, time to make that money work for you. Invest!! Take 15% of your gross household income and invest it into a Tax Free Savings account, your work’s matching RRSP etc. Remember, time is of the essence and you will benefit from compound interest when it comes to this step. Stay consistent and soon you will be a millionaire. It’s just math! Now that your future is taken care of thanks to investing it’s time to start saving for your kid’s post secondary education! The Canadian government has something called the RESP and by contributing to it the government matches 20% of your contributions up to $500 a year. (aka, free money!) This is a great way to start saving for your child’s education. Now, there’s just one more debt standing between you and a truly debt free lifestyle. Can you imagine not having a mortgage payment?! I’m freaking out over here just thinking about it! Any extra money you put towards your mortgage is going to shave off so much interest and so many years off your mortgage! This is a huge one, and usually, especially in Canada, we don’t often find mortgages for 80 or 90k like our neighbours to the south do, so our debt here is quite large. Just keep at it. You have no payments, your life is well set up after following all the baby steps, so enjoy your money while paying down your house faster! Max out your RRSP and TFSA investment contributions per year, and have FUN. As Dave says, you live like no one else so that later you can live and give like no one else. Become incredibly generous, and do whatever you want. You have done so well. Congratulations! All the baby steps and more on the entire idea behind Dave’s plan, including his own personal story, is detailed in his book the Total Money Makeover, which I could NOT recommend more. I actually wrote about My Top 5 Personal Development books and you better believe this was on that list! Best of luck on your journey. Are you following his plan? What baby step are you on? This post contains affiliate links. What does that mean for you? It doesn’t cost you anything extra but I get a small percentage of your purchase if you decide to purchase something from the post. I do this to make some side income while linking you to the great products I use. I will never write a post about a product I do not believe in, and no one has paid me to write this post. All opinions are always my own. Just like supporting a friend’s small business, by clicking on my affiliate links you are supporting a small time blogger who deeply appreciates it. Read more about this on my about page. This is such a great post! I could definitely use some financial advice, and would love to have my student loans paid off! Thanks so much for sharing! Thanks for sharing these baby steps. I’d love to be debt free and work so hard to get there. It really is baby steps but so possible. This is really great information everyone should be aware of!! Great info. I’m not on the plan but I can see how it would be helpful for many.